Thousands of people gathered at Sydney harbour to see a rare reunion between two renowned passenger liners, the Queen Mary 2 and the Queen Elizabeth 2. 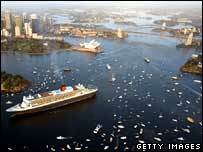 The QM2 - the world's largest passenger liner - arrived at dawn accompanied by a fleet of small boats. When her sister ship sailed into Sydney some 12 hours later, the two vessels saluted each other with their horns. The event was being marked with a fireworks display before the QM2 departed for Hong Kong before midnight. Crowds of people got up at dawn to witness the arrival of the 23-storey, 150,000-tonne QM2, which is on its maiden world cruise. It docked at a naval base because it was too large for the harbour's international terminal. Traffic in the area ground to a halt as people stopped to look and police closed some areas ahead of the evening arrival of the QE2. It was also escorted in by a flotilla of yachts, kayaks and tugs. "I'll never forget this as long as I live," said British tourist Joanne Fowler. "I'm amazed at how huge the Queen Mary is - the QE2 is enormous, but she is dwarfed by her big sister," she said. 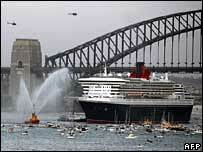 The last time Cunard's royal liners made a dual visit to Sydney was in 1942. Then the original Queen Mary and Queen Elizabeth were troop carriers dubbed the grey ghosts taking Australian soldiers to war, and their arrival was a closely guarded secret.